From the moment Gene Autry co-wrote and recorded Here Comes Santa Claus in 1947, the song has served as a Christmas classic for children and the young-at-heart. Now illustrator Bruce Whatley uses his artistry to bring to life the song's lyrics of hope and goodwill in his tale of a curious North Pole puppy that stows away on Santa's sleigh for an unforgettable Christmas adventure. This beautiful 28-page hardbound large-sized picture book, 11" x 10", includes the music and lyrics. 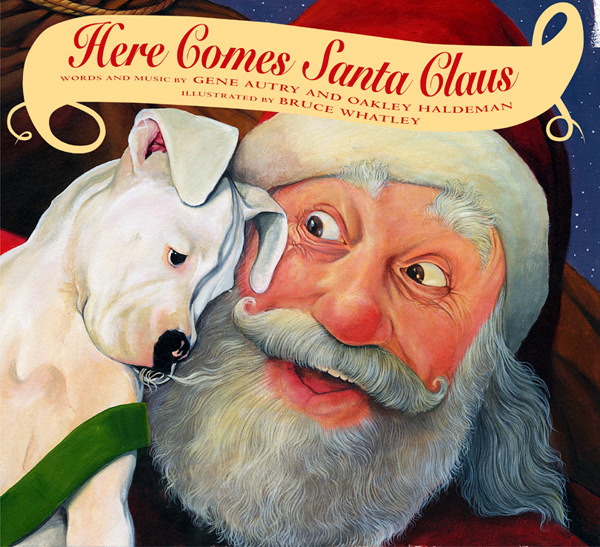 Here Comes Santa Claus, words and music by Gene Autry and Oakley Haldeman, illustrated by Bruce Whatley (HarperCollins, $16.99). Whatley's realistic paintings bring Santa and the stowaway North Pole puppy, Tinsel, to life in this picture book based on Autry's beloved song. Whatley complements the lyrics with a visual tale of Tinsel and the boy who asks Santa for a puppy. Autry and Haldeman's lyrics and music are included in the front and endpapers, but it is snow-white Tinsel who may send young readers clamoring for their own puppy. Autry, Gene & Oakley Haldeman. Here Comes Santa Claus. Illus. by Bruce Whatley. Unpaged. Score. CIP. HarperCollins. Oct. 2002. Tr. $16.99 ISBN: 0-065-028268-1; PLB $18.89. ISBN: 0-06-028269-X. LC 2001039373. Pre-School - Grade 1. Written in 1947 when Autry heard children repeat the title phrase at a Christmas parade, this song is still popular today. Whatley makes it even more inviting with his realistic, full-color paintings that include an endearing visual subtext that dovetails with the lyrics. As readers follow a family through Christmas Eve, a puppy stows away on Santa's sleigh and ends up as a much-wished-for gift. This story-within-a-story adds another layer of meaning to the words. The score and all of the verses appear on the endpapers. Great for storytimes or for one-on-one sharing.